The use of Dust Deposit Gauges from Getex is often used to provide a long term inexpensive method to continuously monitor your worksite for deposited particulate matter that rapidly settles from the air. A system of Dust Deposit Gauges is set up in accordance with AS/NZS 3580.10.1:2003 Method 10.1: Determination of particulate matter – Deposited matter – Gravimetric method and is a widely accepted method, used most commonly adjacent major road/tunnel and inner city construction works over long periods of time. What is a Dust Deposit Gauge? A deposit gauge consists of a 150 ±10mm diameter funnel supported firmly by a glass bottle which has a minimum volume of 4 litres. The funnel is supported using a rubber stopper with a groove to allow water overflow under excessive rainfall conditions. 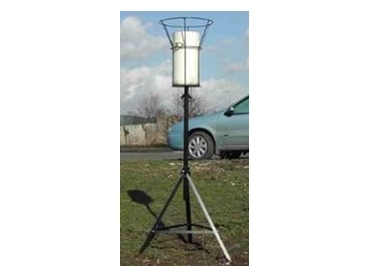 A stand supports the deposit gauge such that the top of the funnel is 2 ±0.2m above ground level. The stand generally incorporates a container to protect the bottle contents from sunlight which may accelerate algae growth. The stand must be sufficiently sturdy to prevent any movement during high winds and to ensure the top of the funnel remains in the horizontal position. What are Particulate Matter and/or Deposited Matter? Particulate matter (PM) is a mixture of particles that can adversely affect human health, damage materials, and form atmospheric haze that degrades visibility. PM is usually divided into different classes based on size, ranging from total suspended particulates (TSP) through PM 10 to PM-2.5 (particles less than 10 microns or 2.5 microns respectively in aerodynamic diameter). PM includes dust, dirt, soot, smoke, and liquid droplets directly emitted into the air by sources such as factories, power plants, cars, construction activity, fires, and natural windblown dust. The term Deposited Matter refers to particulate matter which has fallen out of suspension within the atmosphere. Note: There is no direct method of conversion between deposited matter and TSP or PM10. Particulate matter-Deposited matter sampled by this method is predominantly dust particles that rapidly settle from the air. The method is used primarily to establish long term trends and to investigate localized dustfall. Some common sources of such particles are surface mining operations, industrial processes, unsealed roads and natural causes such as wind-blown dust. The particulate matter-deposited matter can be analysed for any contaminants of concern: i.e. trace metals, organic species and silica. Deposit gauges are relatively inexpensive and are more suited to long term monitoring. They are the most simple yet most effective form of dust monitor available (Environment Australia, 1998). Their main advantage is that they do not require an electrical power supply, they can be deployed in remote areas and can be left in the field for long periods of time. However, their disadvantage is they do not provide data on a day by day basis, information on dust concentrations, nor relate dust levels to wind direction or particular events. If there is a major dust problem it will not be known until the end of the monthly cycle. Equipment such as High Volume Samplers (or TSP High Volume Samplers) can provide day by day data (an average dust concentration taken over a 24-hour period) and Continuous Particle Monitors can provide real – time data. Matched with event data and wind activity, Continuous Particle Monitors offer a real advance over other methods in managing certain sites, activities and dust emissions. Further advice on these items can be obtained from your GETEX consultant. Over a 30 ±2 days sampling period, dust particles from the ambient air are collected in a vessel and retained together with any rainwater. The sample is passed through a sieve to remove any leaves or insects. The insoluble and soluble solids are separated by filtration and the mass of the dried insoluble solids is gravimetrically determined. Ash and combustible matter content are determined by incinerating the insoluble solids. Soluble solids are determined from the filtrate. The mass deposition rate of deposited matter is calculated from the mass of solids, the funnel cross-sectional area and the exposure period. The results are either reported in g/m²/month or mg/m²/day. This result is then compared to the appropriate DEC criteria. Sampling is performed on a month by month basis to establish a trend to determine if the levels of deposited matter are increasing or decreasing during activities that may be causing the production of airborne dust. Refer to DEC Document Approved Methods for the Modelling and Assessment of Air Pollutants in New South Wales, August 2005 and NERDDC 1988, Air Pollution from Surface Coal Mining: Measurement, Modelling and Community Perception, Project No.921, National Energy Research Development and Demonstration Council, Canberra.